About 10 days ago I was lucky enough to attend the OpenShift Commons Gathering at Savoy Place in London. 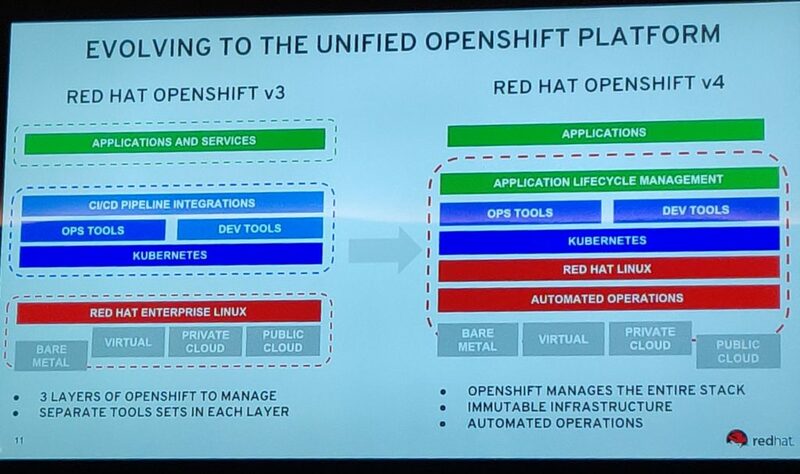 I’m familiar with RHEL and many of the other Red Hat products, however OpenShift is still relatively new to me. OpenShift 4 is due to become Generally Available (GA) in March or April, therefore, it was a privilege to attend and learn direct from the subject matter experts. Service Mesh was the hot topic in containers a few months ago, but now all of the attention is on Operators. If you are interested in learning more check out the Interactive Operator Framework learning portal. The installer for OpenShift 4 has been re-written and the initial setup now uses Terraform. My favourite talk was from Dan Walsh on container security. New dedicated container tools such as podman, buildah, cri-o and skopeo mean you no longer need the docker daemon and no longer need to use root. Use SELinux – it works! A lot of work has gone into making upgrades easier. If you’re upgrading from OpenShift 3, there will likely be a migration tool to move you to the new version rather than performing an in-place upgrade. There’s a strong community of vendors who provide add-ons to OpenShift, ranging from storage options to container scanning tools to tracing and monitoring. If you’re running OpenShift on-premise on RHEL, Centos or Atomic (RHEL/Centos) you may be able to move to Red Hat CoreOS or Fedora CoreOS. Q: What goes into delivering OpenShift? 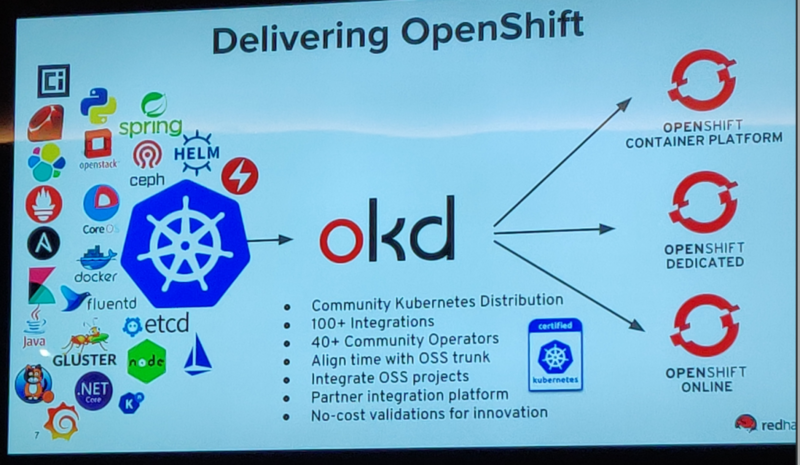 OpenShift 4 comes at a time when we are moving into the third era of Kubernetes. 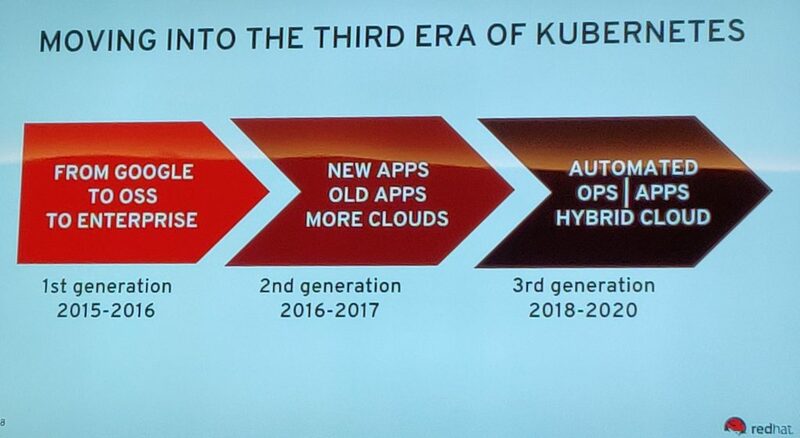 Are we now moving to the third era of Kubernetes? OpenShift 4 brings together new management features to make Operations easier. The out of the box experience from OpenShift is pretty complete compared with deploying Kubernetes from scratch. However, an impressive number of companies offer products to enhance the OpenShift experience. It was interesting to chat to these vendors and their sponsorship makes the event possible.